It is almost term 2 holidays. MissK and MissGs school gives out mid year report cards this week. MissK has not received hers yet, but MissG brought hers home today. I read through it and was pleased with all the comments her teacher made... she is achieving well academically and her teacher reports she has a good attitude and loves learning, she takes pride in her work, she is confident, flexible and can compromise, she is considerate of others and is sensitive toward their needs. None of this was news to me. Despite what some "experts" would have us believe, Autistic kids are not completely rigid and inflexible. They are not completely self centred. They are not unable to empathise with others. In an environment that supports their needs, Autistic children- like my MissG- are compassionate and confident beings who can really enjoy being around others. We see this with MissG at home when she offers toys to her little brother when he is upset, when she helps out when others need it, when she shares with her sister, and in many other situations. We work hard at home to maintain a safe space for everyone, and when we get it right this is the result. When we do see behaviour that some would label 'rigid', 'inflexible' and 'demanding' in MissG we can almost always identify the cause as being a sensory need that we have failed to meet. I'm so encouraged to see evidence that the school is also working to support her needs and is succeeding. MissG's class teacher is very good at this. Knowing that MissG is comfortable enough at school to be able to be flexible is a big thing for me. Those who have been reading the blog for a while will know all the preparation we did before MissG started school (you can read about it by clicking here, if you are interested- the link will open in a new window). We chose the school we did because we knew the teachers there are good at supporting kids in an individual way. The hard work and careful planning are paying off. It was lovely to read all the positive comments about how well MissG is doing at school. But the comment that really spoke volumes to me wasn't about how MissG is interacting with others, or how she was performing academically. 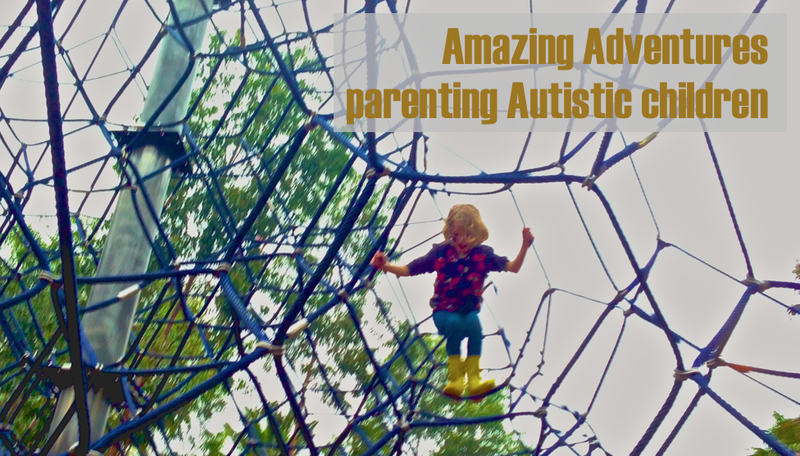 My biggest concern for MissG when she started school was how she wold manage when she experienced sensory overload or when she had difficulty communicating her needs when stressed. We have done our best to support MissG by giving her specific scripts to use when talking to others, and also to say to herself, when she is stressed or overloaded. We have done our best to support her by introducing strategies she can implement when she feels overwhelmed. "She is learning to deal with her emotions in a positive way and can independently calm herself so that she can carry on with activities." Which isn't to say that she doesn't struggle with this at all anymore, or that she always gets it "right"- just that more often now at school she is managing this on her own. And that is progress toward managing the challenges she faces well and independently. Well done, MissG, well done. I know how much effort this takes for you. I am one super proud mum tonight. 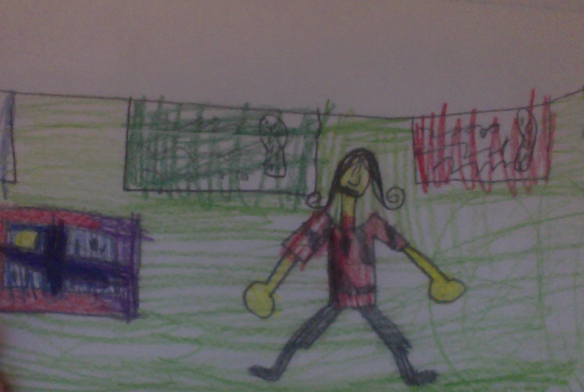 Image is a picture drawn by MissG of her, wearing a red shirt and black pants, standing in her classroom. There is a light green back ground on the bottom half of the picture with a line of drawings (one dark green and one red) hanging on a string just above her head height, and a purple and red window to the left of the picture at her was it height. This picture is shared here with MissG's permission. We live in the Blue Mountains, NSW. Each winter solstice there is a community event called Blue Mountains Winter Magic Festival. It's a huge day for our community. This year they estimate there were 40,000 visitors to the festival, which is held in the small town of Katoomba. You can get an idea of how full on it is by looking at this news story, and checking out the pictures on the Winter Magic Facebook page. MasterL chooses not to go each year. He just doesn't get enough enjoyment from this sort of thing to make the crowds worth while dealing with. MissG always wants to go. She loves the music, especially the drums, and she loves seeing all the wonderful costumes and amazing puppets, props, displays and performances. Even though she loves it, it is a massive challenge for her- the sensory input is extraordinary and takes a toll on her very quickly. When she was younger we could help her cope by letting her ride on our backs in the Macpac carrier. She is too big for that now, so other strategies are necessary. This year MissK was playing cornet in the City Band as part of the Parade, so we were committed to being there at least until she was finished, and we had to be there in time for her to meet up with the band well before the parade started. MissG wanted to dress up this year, as many people do. 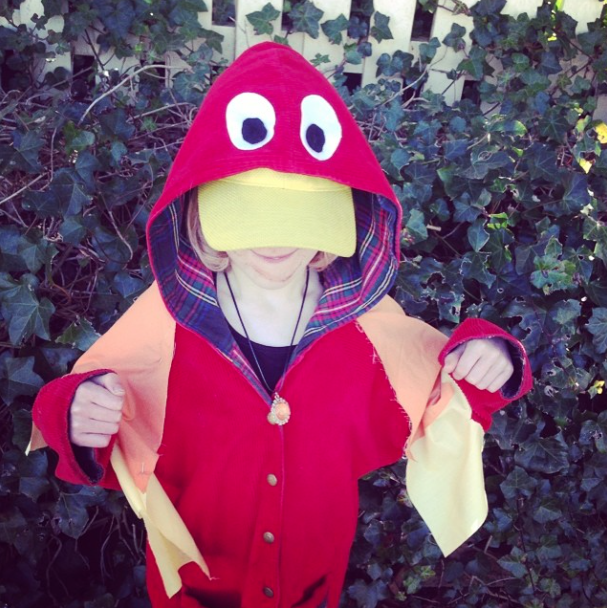 The theme was Phoenix Dreaming (a recognition of the strength of our Mountains community in the aftermath of the devastating fires that claimed over 200 homes last summer), so she wanted to be a phoenix. We made some additions to a red coat, and she was ready!! yellow fabric feathers draped over her shoulders. height in the middle of a bit of a flap. We had to drop MissK off at 10.30, so we took some time to walk around and see the stalls set up before hand. We did a little shopping, visited the stall of a lovely friend (who so insightfully offered the space under one of her tables as a sensory refuge for MissG if needed- thanks Jeni, you are a star!!) and slowly made our way to the drop off point while things were still relatively quiet. We dropped MissK off, and heading back to the main festival area to pass the time until the parade started. By now it was getting very busy, and very congested. So we decided to get out of the crowds for a while, and go do some chew therapy! One thing that helps MissG calm when things are stressful is chewing and sucking. We went and got a drink and and a chewy snack and found a quiet place to sit and eat. After 20 mins of quiet and chewing, MissG wanted to go and look at some more stalls, so we headed back into the crowd, but after only a few minutes it was enough, and she was really struggling. Because of the crowds it was hard to get to a quiet place quickly and poor MissG started to meltdown in the middle of a group of people. Just then a lady who was giving out balloons appeared, and MissG latched onto that as what she wanted to do to help calm herself. We grabbed a balloon and continued to head for a quiet spot (it really helps to be very familiar with the town in these sort of situations, I knew exactly where we could go to give her a break- if we had been somewhere unfamiliar this would have been much harder). In our quiet spot MissG busied herself with making the best balloon shadows she could, experimenting with the angle and height to get the best amount of colour showing through in the ballon shadow. 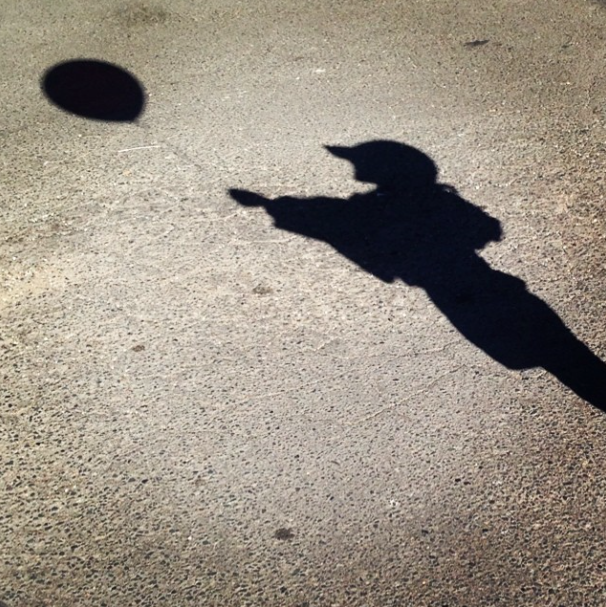 She especially liked this shadow, and asked me to take a photo of it. balloon in front of her and looking up at it. After a while we decided to go back and see if the parade was starting soon. We found a not crowded space between two stalls next to a lovely lady with a cute puppy, who offered for MissG to move in front of her so she could see easily and not be squished, and we settled in just in time to see MissK go past. 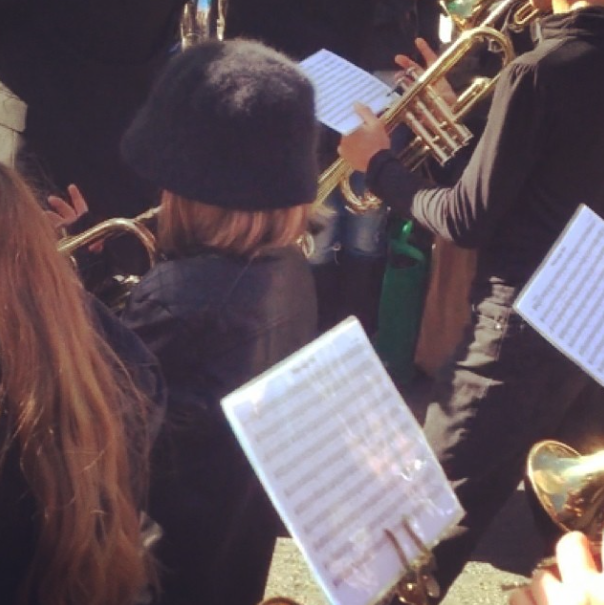 brass instruments while marching in a parade. The back of MissK can be seen in her furry bucket hat. trumpets and cornets visible everywhere. And as soon as she saw her sister go past, she was done. She needed to go, and that was that. We excused ourselves past the people behind us, and headed for the place we organised to meet MissK. Fortunately there was a good wall for shadow making while we waited. 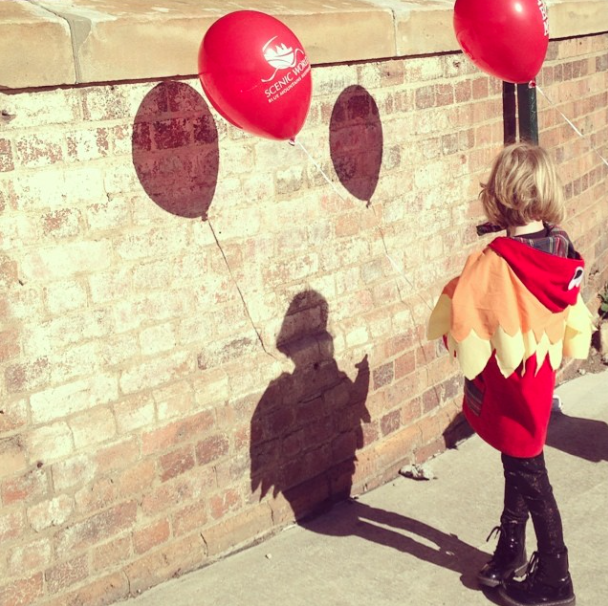 Image is of MissG in her phoenix outfit, facing a brick wall holding her red ballon. There is another ballon above her head being held by a person out of the photo. There is a shadow of MissG and her balloon on the wall, and the shadow of the other balloon next to her on her right. I was so proud of both my girls today. 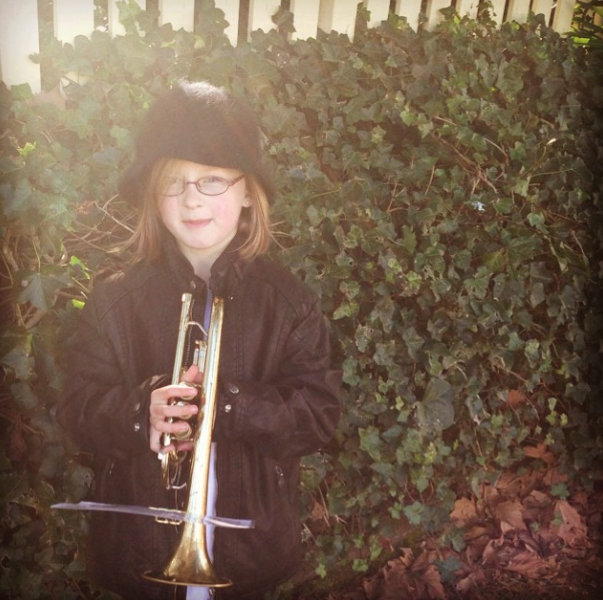 MissK for trying something new- it was a huge effort for her, after only learning cornet for a short while, to join in the parade. She did so well. And MissG for knowing her limits and letting me know what she needed to do to manage her stress and overwhelm. We left home at 9.30. We arrived back home at about 1.00. Three and a half hours of pretty much too much everything. Even though it was hard, even though she did have an overload induced meltdown, her impression of the day was "It was good". And the best bit? "It was when we got the dolly". This blog started 2 1/2 years ago mainly as a record of what we were doing, and to try to reach out in an encouraging way to other families. At some point in the past year or so, I stopped writing about our day to day and turned into an activist. It seems that every time I sit down to write I am angry about one injustice or another. It’s almost like writing about the “little” things is boring now. If there isn’t something brewing in my mind to write about that has me pretty worked up, it’s an unusual day. The trouble with that is that it is exhausting. And only writing about that stuff is an unrealistic representation of what I actually do every day. Sometimes I feel like, in the fight to advocate for the rights my kids have in the bigger picture, the little things get lost in my writing. My day to day is not full of face to face situations in which I must actively defend to others my kids rights to exists as proud Autistic individuals. Some days do involve that, but thankfully they are not the majority. Mostly what I do each day is support my kids to help them discover the ways that work for them to live the best way they can. I’ve been working on finding ways to help MissG process language more efficiently. She wakes up very slowly in the mornings, as her sensory system relies on a lot of physical movement and stimulation to kick off each day. It’s hard for her to process auditory requests, especially in the morning, so getting ready for school is tough. After talking with some friends I learned that some of them also find auditory processing of spoken language difficult, but that they can process singing more easily. So, I have been trying singing to MissG in the mornings, using tunes I know she likes and putting the words of my requests to music. It’s helping!! 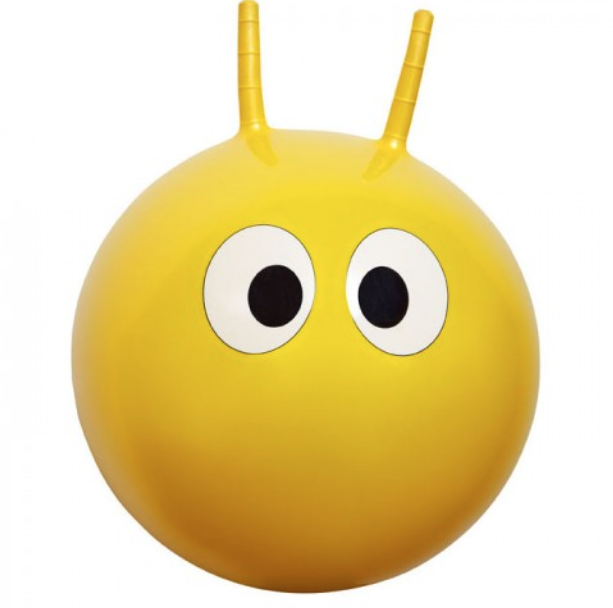 and big eyes printed on it. After re-reading the OT report from a couple of years back I remembered that bouncing was recommended as a way to help stimulate MissGs sensory system too, so after talking to her last night about how hard it is to wake up she agreed that it’s too cold out to use the trampoline in the morning but she would like to try swinging on her rocking horse to see if that helps her feel more prepared to leave the house for school. This morning she came to wake me up and tell me she had already done some rocking, and was ready for breakfast. For MissG to be ready to eat before 8 in the morning is unusual, so I'm calling that a win! Hopefully it is something she will find helpful over time. She did say to me this morning that she wants to get a "bouncy ball" again because she misses her old one. I promised to look for one to buy for her. MasterL is now homeschooling, after a series of things happening that brought him and I to the conclusion that school was no longer a place conducive to learning for him. 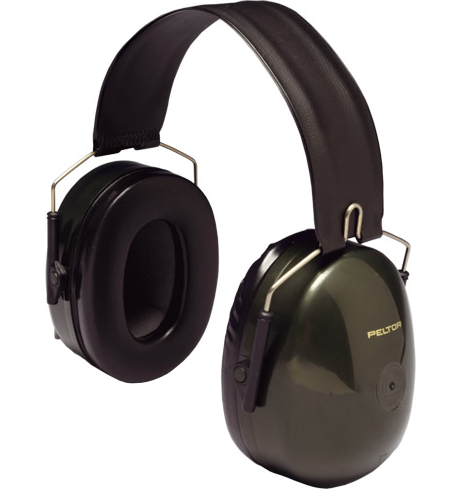 Today he was at the hardware shop with Hubby and I looking for a way to store the paints he is collecting to use on his model planes, and we saw a pair of ear defenders. It struck me what a difference removing him from the stress of the school environment has made, as he confidently said he would like to choose a pair to wear because sometimes the noise is just too much. 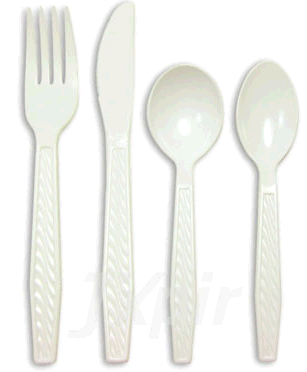 We have introduced plastic cutlery as an always available option for use at meal times in our house, because metal cutlery is a sensory problem for MissG. Sometimes the accommodations are small, but they make such a difference. She ate a whole meal with a fork for the first time the other day. So, even though you will often see me writing about the “big stuff”, rest assured, life carries on here, one little decision, one little change, one little accomodation, one little success at a time. Note: I wrote this article on 25th April 2014, and it was originally published at The Huffington Post. It is similar to an article I posted on Different kids of normal, but written specifically related to Autism. Trigger warning for discussion of murder of disabled children, and discussion of the stigmatisation of Autistic people. April. Autism Awareness Month. And another murder. Sixteen-year-old autistic boy Robert Robinson was murdered by his mother, who then killed herself. News reportssay she couldn't cope with her son's allegedly violent behavior and the lack of support she had in caring for him. So they sympathize with her. They encourage us to feel sorry for the woman who murdered her son. They want us to pity her and justify her ending her child's life by blaming her stress on him being autistic and his "violent" behaviour. There have been other children murdered by their caregivers over the years. Too many to name. How do we get to this point as a society? How is it OK to learn that a child has been murdered by their parent and then feel sorry for the murderer? Are you familiar with the term "stigma"? There are lots of things that people can be stigmatized for. Some stigma is quite subtle, falling into the "label" category, some is more obvious and in the "denounce" category, and some really noticeable and easy to see as vilification. "Oh, no! So what do you do? Are they like real members of the family?" The reason people feel sorry for me when they find out my kids are autistic is that they don't know anything about autism except that it makes them hard to live with. They know this because the media tells them. And this is what I'm talking about when I say "autism awareness" doesn't help autistic people, and that the media has no place blaming autistic children for their own murders. So instead of listening to the facts being spoken by autistic people and their allies, people listen to the media tell them that autistic people are violent and difficult to live with. So society moves down the slippery slope of assumption until it reaches the point where vilifying children based on a diagnosis is acceptable. Did you know there are autistic adults all around you? They are working as doctors and nurses, teachers, ambulance officers, cleaners, artists, writers, professors, journalists, pilots, executives, actors, sportspeople, good parents. But many of them don't tell you they are autistic because they don't want to be stigmatized. When they were younger, they were kids who were just like Robert Robinson and all the other children who have been murdered by their parents for being autistic. Some were nonverbal as children, some still are nonverbal as adults and are making significant and valuable contributions to society as writers and poets, and some were labeled "violent" as children and are now working with children like them as their mentors. So why do the media report on murders of autistic children by blaming the children and sympathizing with their killers? Well, basically, they do it because it sells. People want to hear that story. It gets ratings. They do it because the public wants to hear it. And for that we should all be ashamed. We are encouraging the media to help perpetuate the stigma against autistic people. We accept these stories without batting an eyelid because we have already been primed to believe that disability is bad and we don't bother to question it. When we sit quietly by and listen to this discourse, we are complicit in the murders of innocent people. When we sit silently and fail to question the assumption that mental illness or disability is the cause of violence, we support the media in their continued assault against people like my children, who just want to do what they need to -- and receive the supports they require -- to live their lives as productive and happy members of society. Are you happy to let Robert Robinson's death be blamed on him being autistic? Are you happy to be part of the continued stigmatization?